Cranberry juice was compared to Lactobacillus in children with recurrent urinary tract infections by researchers at the Catholic University, in Rome, Italy. 84 girls, 3 to 14 years old were randomly assigned to a treatment group for 6 months. Only 4 patients discontinued treatment early. There were 34 episodes of urinary tract infections. The incidences of at least 1 urinary tract infections were as follows. 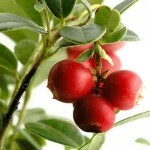 The value of cranberries to prevent urinary tract infections is mixed as reported here and here. This entry was posted on Tuesday, December 8th, 2009 at 8:31 PM	and is filed under Children, Cranberry, Infection, Pre, Pro, Synbiotics. You can follow any responses to this entry through the RSS 2.0 feed. You can leave a response, or trackback from your own site.